A search is continuing in the French capital today following the disappearance of a young Inishowen man attending Euro 2016. 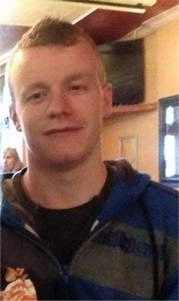 Lee McLaughlin (19) was last seen leaving the Ibis Paris Montmartre hotel at midday on Tuesday after attending the Sweden v Ireland game the previous evening. He was due to fly back to Ireland with his father and cousin later on Tuesday but did not arrive to check in at the airport. His worried family say the teenager wasn't answering his phone yesterday and the handset is now off. They say his disappearance is out of character for the young man. “This is our brother Lee, he has been missing in Paris since (Tuesday) morning. He was last seen leaving Ibis Paris Montmartre at 12pm. (6/14) He was not answering his phone and it is now off. This is very out of character for Lee. The Irish Embassy in Paris is providing consular assistance to the Donegal man's family. Meanwhile, the Football Association of Ireland has shared the family's appeal with its tens of thousands of social media followers. Anyone with information is asked to contact the Irish Embassy in Paris on their 24-7 service number which is 0033-1-44176780 or on twitter @IrlEmbParis.